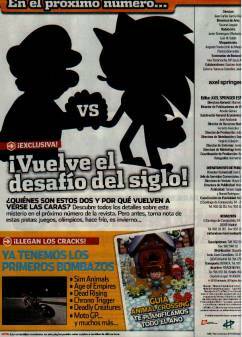 Spanish Nintendo Magazine ‘Nintendo Accion’ is dead-set on confirming the existence of Mario and Sonic at the Winter Olympics. The small scan above is the only proof we have, and I’m still not convinced. With that said, a move like this would make perfect sense. Mario and Sonic at the Olympic Games was a big hit for both Sega and Nintendo. This sequel seems like a no-brainer…but I wouldn’t call it confirmed just yet. Thanks to Redacción for the heads up!